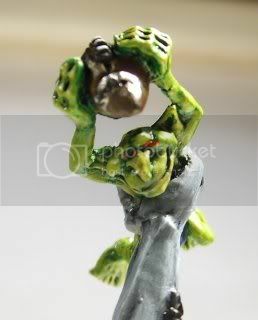 The troll is the model i'm most please of in the team, he's a conversion based on the new metal fantasy troll. 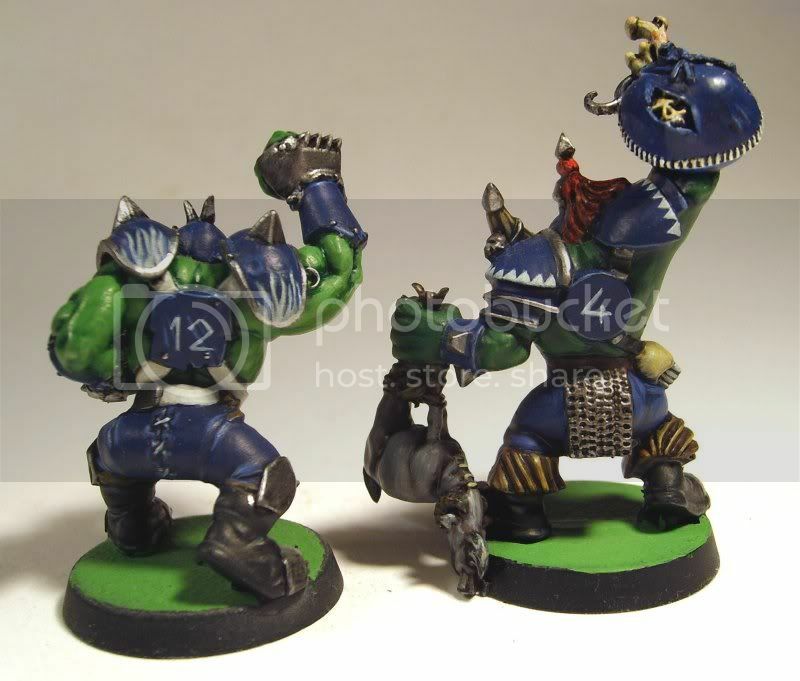 I've added a helmet using a plastic ogre helmet, a thick bit of wire and some greenstuff, the studded glove is from plastic ogres too. 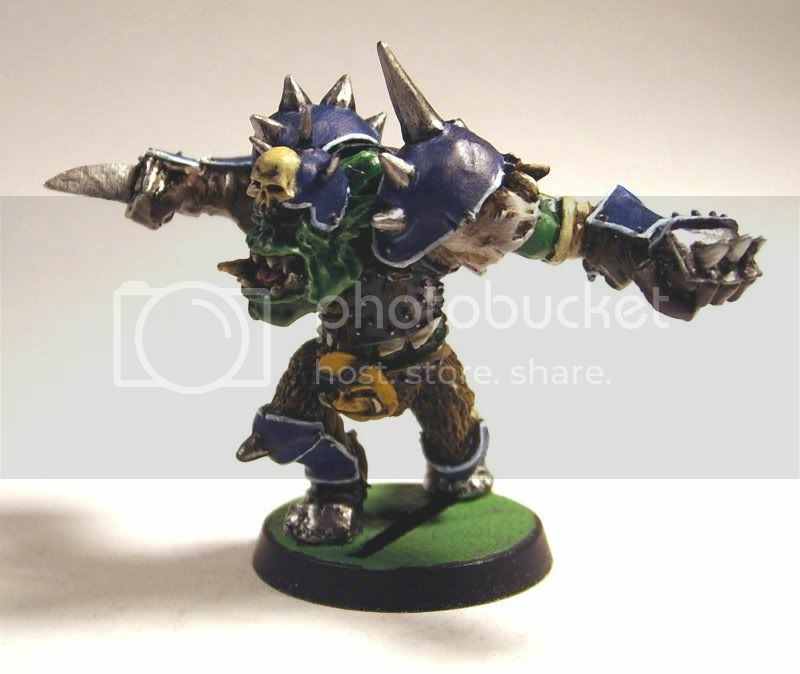 He also has a plastic shoulder pad from the chaos marauders. I've removed the bone from his left hand and replaced it with a snotling holding one of the spare metal balls i had. I'm really please with how the colour scheme has turned out as well, his skin has at least 10 different shades in it and the pale flesh on his belly fades really well into the rest of his skin. 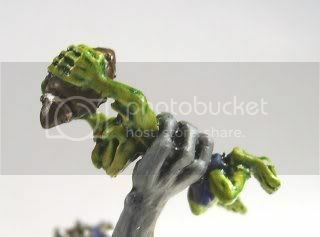 Details of the Snotling ball carrier (not the best pics). 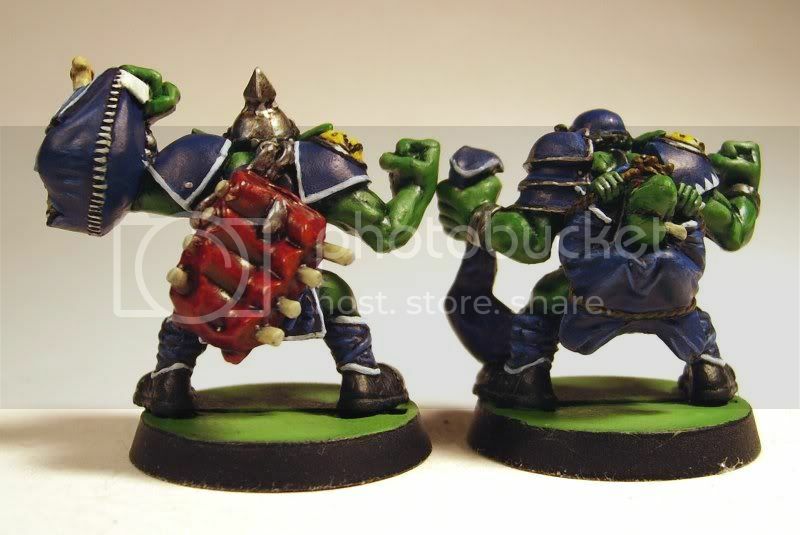 The Black Orcs have turned out really well, i think i have finally mastered the technique for making horns look good, they used to always be a chore for me but i cracked it with Grashnak, i'm rather pleased with their skin tone as well, a good dark shade of green. 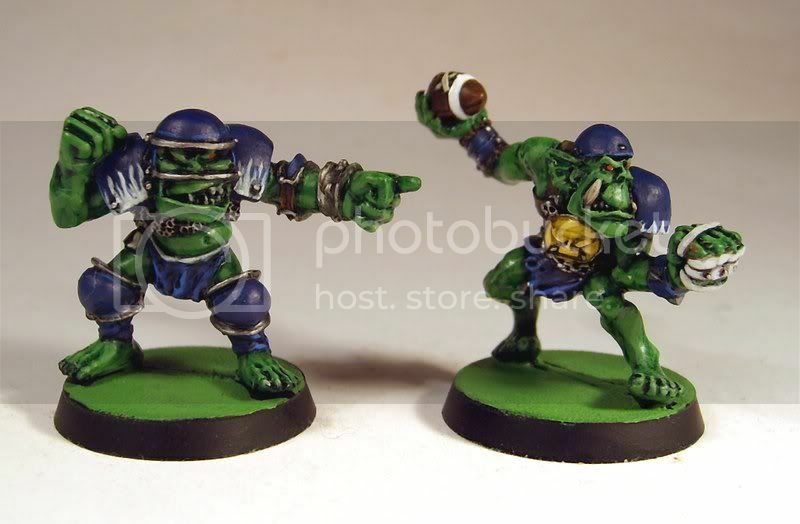 The models shown here are totally finished, they still need the badges and bases done, and i've had to repaint the numbers on some of them as they didn't match up with the FUMBBL team. With the theme being Looterz i have converted a few members of the team to be carrying some ill gotten gains. 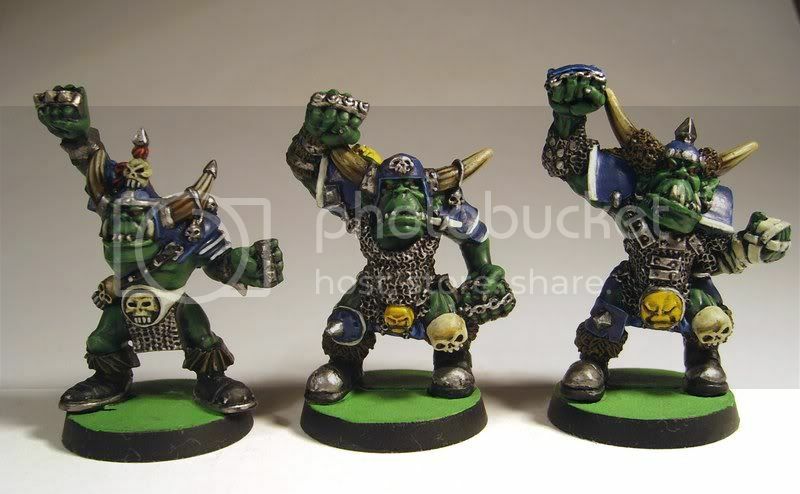 The Orc team has some nice models so i've not gone overboard, but i may add some more bits and pieces to bases to keep with the theme. 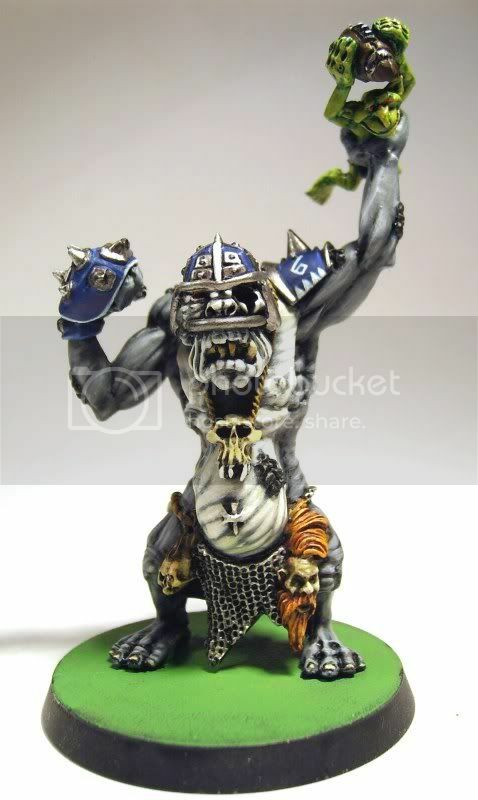 The Black Orc is a conversion based on the plastic one from the boxed set with a bag from the plastic ogres, a face plate from the Orc boyz and the goat from the plastic giant. 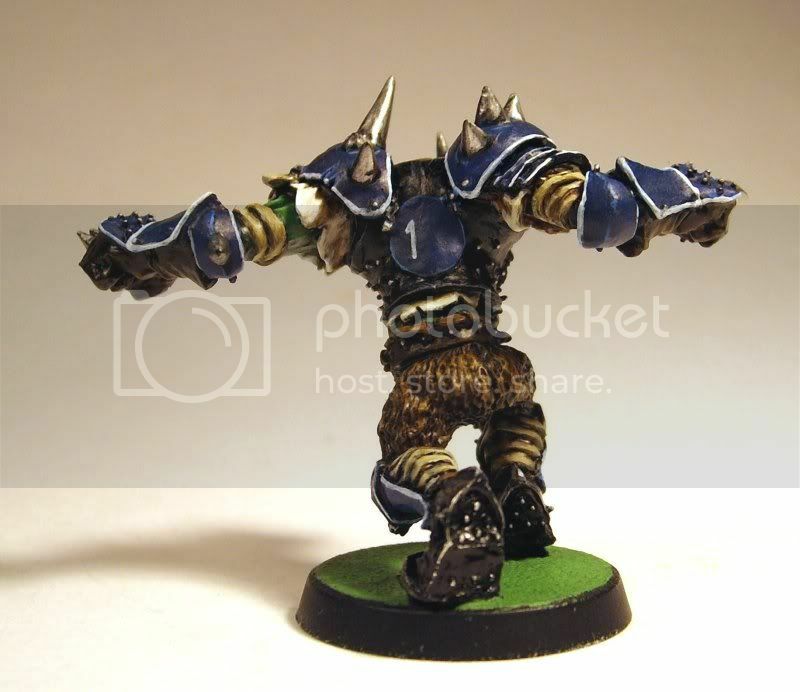 Whilst the Blitzer is made of bits from the Orc Boyz set with the spare head from Vorag, i've trid to build him in a similar pose to the metal Blitzers. 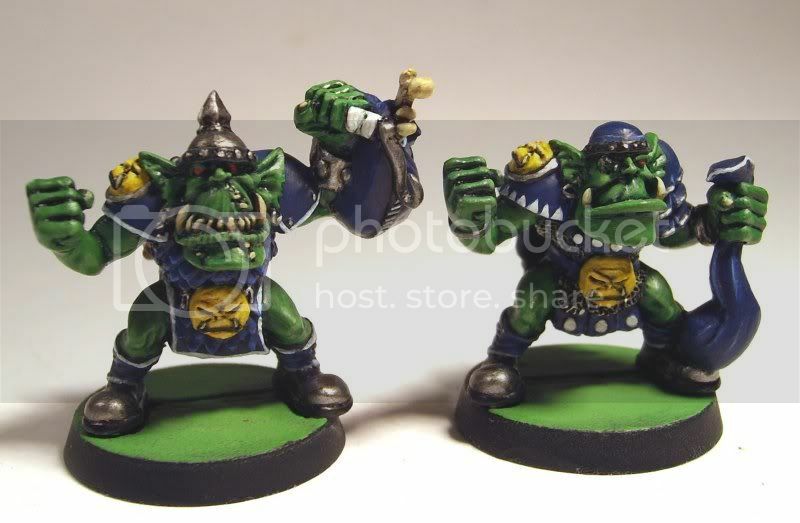 The 2 Linemen will be used as journeymen, and they have some more loot on them, all from the plastic Ogres set. 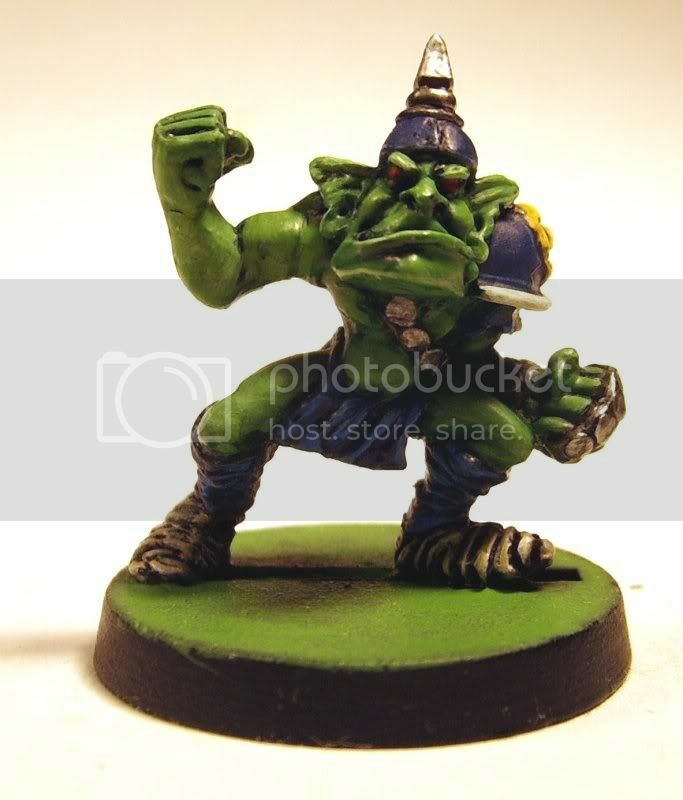 Also a Goblin for the odd TTM attempt, i resisted any conversions for him, but wait till you see the Troll, he's turned out a bit special. 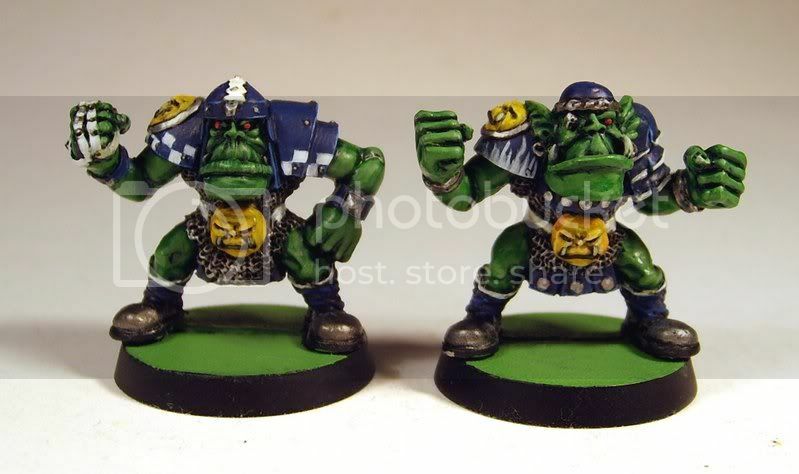 Last of all is Vorag, I've painted him in the team colours, the model is quite nice, but a tad monkey-like in some places (what is up with the furry trousers?). I avoided the fire, dog teeth or checks on his armour for a simple white border, which i think makes his armour look a little higher quality as befits a star. I do still need to change his number to a "V" since he won't have a regular place on the team. 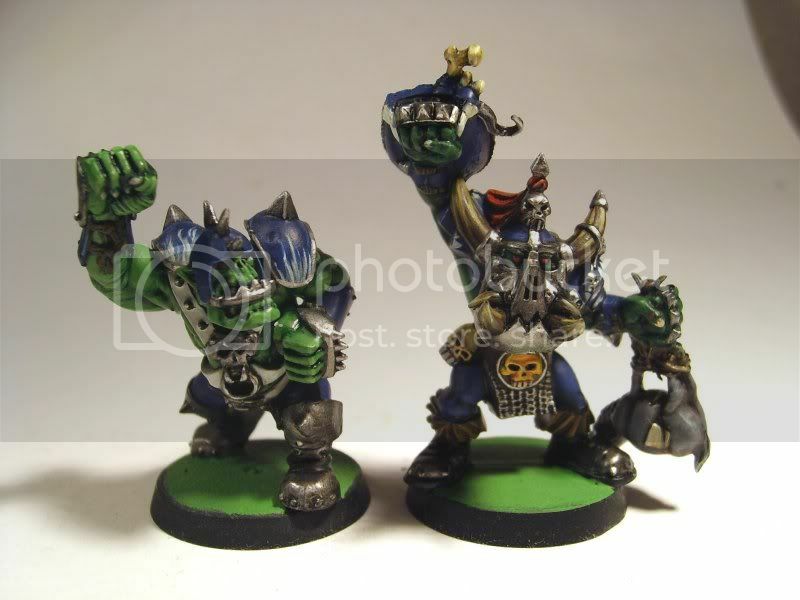 I'm going to be a bit evil and hold the troll back till tomorrow, I'm realy please with both the paint job and conversion so i think he deserves his own blog entry. 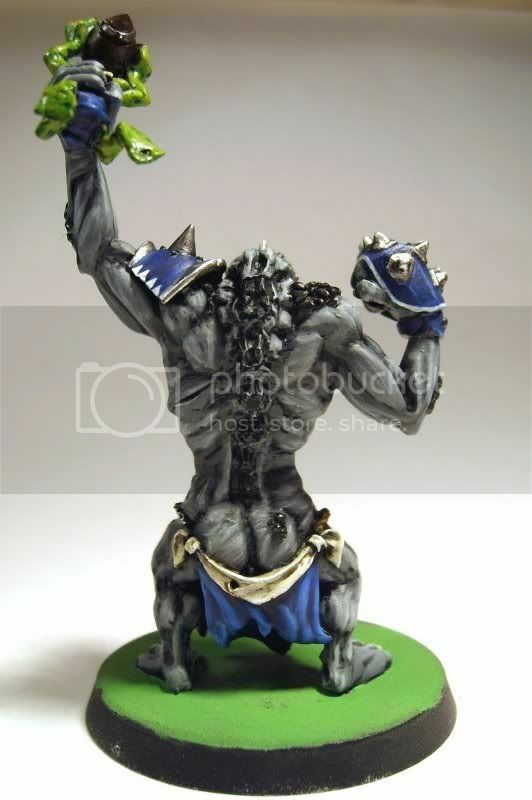 I like his "builder's bottom crack"
Excellent job spubbbba, can you do my high Elves a Troll too ? ?